One of Carbo's tasks as a defensive forward during the great Canadiens-Nordiques rivalry was to check Nords superstar Peter Stastny. A member of the Hockey Hall of Fame, Stastny arrived in Quebec City in 1980 with his brother Anton after defecting from Czechoslovakia. A third brother, Marian, arrived the following year and the three Stastnys became one of only three trios of brothers to play professional hockey on the same team. 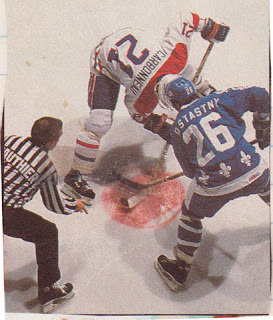 In 1985, the year following the infamous "Vendredi Saint" brawl that saw the Habs defeating the Nords in the playoffs, the Nordiques exacted revenge when Carbo lost a faceoff to Stastny in overtime in the seventh game of the Adams division final, and Stastny scored on the play. Carbo remembered in a Hockey Night in Canada interview in 2008, "I was upset. I let the team down, I let the city down." 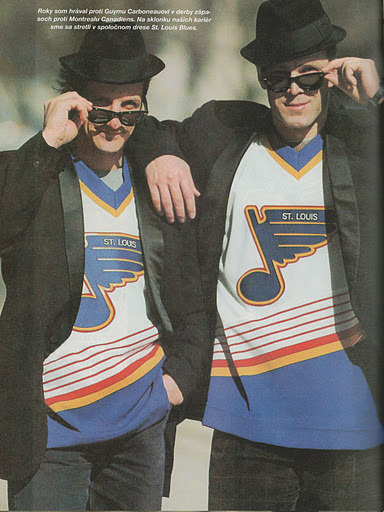 The following year, Carbo said of Stastny: "For me and Stastny, it wasn't love." So imagine my surprise when, the other day, I learned something that I hadn't known before. I consider myself an expert in most things Carbo, but even I didn't know that Guy and Peter Stastny spent a brief time as teammates. Stastny's final NHL team was the St. Louis Blues. Carbo, of course, was traded to St. Louis in August 1994 and spent only that season with the team.